Ride in style with this better quality California Highway Patrol Jacket. Made of selected leather hides with nickel hardware. Features 3 zippered front pockets ( Twin hand pockets & slash chest pocket ), adjustable zippered sleeves, one flap watch pocket. Full removable belt can cinch down so the cold doesn't whip up your back Inside pocket to safeguard personal belongings. Collar snaps hold your collar secure when riding. Epaulettes to hold your gloves or other accessories when needed. Bi-swing back gussets allow easy forward reach, neatly retracting while arms are in a downward position. Removable Zip Out liner will allow the wearer to enjoy all seasons in comfort. Clean and condition these leathers with leather balm. You may use snow seal, or mink oil to weather proof. Matching cream or wax polish can be used to enhance the color. Sizing on these coats tends to be small. Order a size larger than your chest measurement for a snug fit and two sizes larger for a more relaxed fit. Style 018 is made of better grade selected leathers. Expect more uniformity in the color and consistency of the leather. A good quality supple coat that will break into the shape of your body easily and give years of service. 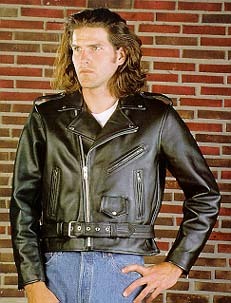 This is one of the best values in leather apparel today. Well worth a couple extra bucks. Most stores will retail this quality of coat at $249.99 to $299.99. They are not ripping the price, they are usually buying through another middle man who makes a rather large margin. We bypass the distributor and go direct to the maker to get this outstanding value.